Today I'm wrapping up my reading for A Victorian Celebration with a joint review of two books that complement each other wonderfully, and thus must be reviewed together: The Buccaneers by Edith Wharton and To Marry An English Lord by Gail McColl and Carol Wallace. As I'm sure you've noticed, astute readers, neither book was written in the Victorian period, although both discuss a most peculiar and fascinating aspect of the late Victorian period: the mad dash of American heiresses across the pond to marry members of the English nobility. Many of these marriages were mercenary at heart on both sides--dollar princesses trading their fortunes for marriage to cash-strapped, but titled, English gentlemen in need of money to support vast estates and other trappings of aristocratic life. The Buccaneers offers a fictional look at the privileges and pitfalls faced by one of the first bands of American girls to go husband-seeking in England. 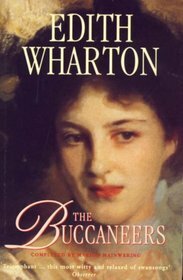 Edith Wharton's last novel, The Buccaneers was unfinished at the time of her death in 1937. It was later published posthumously, with the ending completed by Wharton scholar Marion Mainwaring, drawing from Wharton's notes. To Marry An English Lord offers a look at the real-life heiresses that inspired Wharton's fictional tale (she borrowed heavily from the lives of New York society girls in her orbit) and thus offers a delicious counterpart to the novel. Because we've got twice the territory to cover here, I'm going to keep things short and sweet in my reviews. Here we go! The Buccaneers is somewhat of a departure from Wharton's normal writing style. Here she adopts a dizzying multi-narrator style, with the story switching perspectives through a host of characters, including multiple American heiresses and their mothers, several British gentlemen, and one very loyal British governess, just to name the main players. The characters are both the story's biggest strength and its weakness--they aren't as finely drawn as Wharton's memorable figures from earlier works (Annabel St. George, the main heroine, is no Lily Bart). Yet, although the portraits are more superficial, they are nonetheless satisfying and keep the reader engaged through the various plot twists and turns. It's clear the novel was very much a work in progress at the time of Wharton's death--the writing feels unfinished, the social commentaries (always Wharton's great strength) sketchier. However, the elegance of Wharton's writing remains and some of her passages about English life and the English countryside are just magnificent. And, for her part, Mainwaring does an admirable job finishing out the final quarter of the novel in a very credible imitation of Wharton's writing style. Overall I give The Buccaneers 5 out of 5 stars. Now, I am something of an Edith Wharton groupie, so do keep that in mind here. But, quibbles aside, the story is a lovely one and it offers a fascinating portrait of the strange joys and sorrows known to young American girls living in England in the heady days of the Gilded Age. Do me a favor. If you're now intrigued by The Buccaneers, do not read it until you've first read To Marry an English Lord--or at the very least, the first few chapters of this great nonfiction book. Why? To Marry offers a fascinating inside look of the many real figures that Wharton borrowed liberally from to create her band of buccaneers. One part-gossip column, one part-historical analysis, To Marry is a treasure in its own right to be sure, but it also makes The Buccaneers a much richer and rewarding book to enjoy. With amusing details about New York and London society, the mores of the British upper-class, and the husband-hunting tactics of American heiresses, To Marry is a fun and informative read--and a real-life primer for The Buccaneers. I read The Buccaneers a couple of years ago and liked it, but the last third really disappointed me -- Mainwaring just couldn't compare to Wharton's elegant prose. It was nice to read the ending but it just wasn't the same. But I did receive To Marry an English Lord as a birthday gift recently and I look forward to reading it! You know, I wasn't disappointed in the last third of the book but I did felt that the narrative speed was off--it moved way too quickly, I think, and didn't match up with the details and pacing in Wharton's part of the novel. It also didn't have quite the poignancy of Wharton's part--that's one thing I've always loved about her writing. At her finest, there's a magical, breathtaking quality to her prose that is very, very hard to replicate, no matter how faithful the reproduction. But overall I thought Mainwaring did a good job. Changing gears, I hope you have a great time reading To Marry an English Lord, Karen! It's a fun one. Be sure to stop by and let us know what you think! I loved The Age of Innocence and House of Mirth, but somehow I missed this one! I think the 1995 television adaptation is better than the novel. Watch the 1995 miniseries. The characters and narrative are better handled than Wharton's novel. I know. I've watched the former and read the latter.